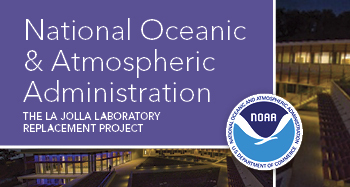 A new five-story, 120,000-square-foot laboratory for the research arm of the National Oceanic and Atmospheric Administration (NOAA) has been completed. ​Effective fishery management starts with accurate scientific information about fish and fisheries. From surveying fish populations to tracking annual harvests, scientists collect and analyze all sorts of data, which fishery managers then use to make sound decisions about the sustainable operation of fisheries. The construction of the new Southwest Fisheries Science Center laboratory was completed with funding from the American Recovery and Reinvestment Act. The building was planned to incorporate a large sea- and freshwater Ocean Technology Development Tank and state-of-the-art laboratories for biotechnology, photogrammetry, life history and necropsy. The newly constructed NOAA Southwest Fisheries Science Center was built in an area that contained coastal sage scrub habitat, which is a rapidly declining vegetation community in the coastal region of Southern California. Located on a spectacular site in famed La Jolla, the project demanded a design that reflects the locale, climate and stunning views. The site, a steep hillside overlooking the Pacific Ocean, presents unique design challenges to maintain sensitivity to the natural landscape and the requirements of a science facility. Engineering ingenuity was critical to successful design of the complex National Oceanic and Atmospheric Association Laboratory in La Jolla. The compact, severely sloped site with 100 feet of elevation difference was cut into a hairpin turn in the road descending the bluff from UC San Diego’s hilltop campus. Ichthyoplankton are the eggs and larvae of fish and invertebrates found mainly in the upper 650 feet of the water column, also called near-surface waters. The eggs are passive and drift in the ocean along with the water currents. NOAA relies on its staff of scientists and biologists to manage the nation's coastal and marine ecosystems and resources. But it also relies on a small navy of citizen ocean aficionados to help gather data on the ever-changing coastal waters: sportfishing businesses and enthusiasts. When NOAA needs to outfit its divers with underwater gear for special assignments — like working in the contaminated waters of an oil spill — a San Diego firm has been their chief supplier for many decades. Robert Ruiz, executive chef at Harney Sushi, is a man who loves seafood. He wants to educate as many people as he can about exactly where and how the fish they eat gets to their plate. He is a huge advocate of serving sustainable seafood -- fish and shellfish that are caught or farmed in ways that are ecologically responsible.